"I enjoy designing watches, and have been a fan of ceramic watches for years. I wanted to create a beautiful, feminine version of a precise time-keeping device in a gorgeous, durable ceramic for my QVC customers. I am so proud of this watch!" Arrive fashionably great! As part of the hottest trend in watches, this statement-making ceramic wristwatch from Isaac Mizrahi instantly updates your jewelry wardrobe with designer style. From work to play, this chic, versatile watch serves as the perfect addition to any ensemble, day or night. Wear on its own or pair with your favorite bracelets to achieve a stacked look that's right on trend with today's fashions. Tick-tock. Material girls will love the watch's up-to-the-minute ceramic construction - a lightweight, durable, and scratch-resistant material - along with its matching mother-of-pearl dial. And, in true Isaac fashion, it's available in some of the most popular colors of the season - creating a high-end aesthetic at a price that's simply ahead of its time. From Isaac Mizrahi Live!(TM). White, Black, Blush Pink, Gray, Nantucket Blue, Lavender, Mint, or Orange Zest. Small, Average, Large, or Extra-Large. 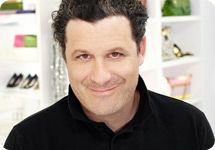 Isaac Mizrahi Live! Ceramic Watch with Mother-of-Pearl Dial is rated 4.6 out of 5 by 1878. Rated 4 out of 5 by BJGQVC from Great Watch, Difficult Battery Replacement Love this watch. Love that I could order in a small, which fit perfectly. Major drawback learned after owning this watch for 2 years, wearing it almost daily. Replacing the battery is difficult even for an experienced jeweller which in turn makes replacing the battery expensive. Rated 1 out of 5 by LI Oyster from Isaac Mizrahi Should Be Ashamed! What a piece of junk. Sent it for repair as directed by the warrranty. Communication with this company was very poor. I was wondering if I'd ever see the watch again. SAVE YOUR MONEY!!! Rated 4 out of 5 by Pags from Nice, But...... Beautiful watch. I bought the brown and ordered a small as I have a small wrist. However, it fits me "just right" and I'm hoping my wrist doesn't get any larger because it will not fit. (Perhaps it I should have ordered the average size and then had links removed so that if my wrist expands, I would have been able to add links back on.) I would have exchanged it for the larger size but I don't want to have to pay shipping again. I wish the watch was available in white; I would then order it in the average size. Rated 1 out of 5 by qvcshopfan from Isaac Mizrahi Watch I ordered the Chocolate color watch that is on clearance and I received an "AS IS" watch. It was thrown into the watch box with the band open, the watch running and no oval piece to hold the watch in the box. Also, all the paperwork had been opened and just folded back up incorrectly. Not happy with the fact that QVC sent me a returned item and it was priced and marked as new on clearance. Rated 5 out of 5 by FM57 from My Favorite Watch I have this watch in two colors. It is my favorite watch and it so comfortable. I have a small wrist and the small is perfect!!! I changed the battery a the jewelers for $5 after 2 years, and it works perfectly.